In the bowl of a stand mixer, whisk together yeast, sugar and 1/4 cup warm water. Let sit until foamy, about 5 minutes. Add 1 tbsp olive oil, flour, 1 1/2 tbsp rosemary, the fine salt and 3/4 cup warm water to the bowl. Stir with the paddle attachment until just combined. Replace paddle attachment with dough hook and knead dough about 8 minutes, adding more flour as necessary to keep the dough from sticking to the bowl (or, knead by hand on a floured surface for 10 minutes). Place kneaded dough in a lightly greased bowl, cover and let rise until doubled, about 1 to 1/2 hours. Brush two baking sheets with olive oil. Remove dough from bowl and on a lightly floured surface, divide into four equal pieces. Flatten each piece slightly into a square shape. Fold corners up and towards the middle to make a diamond, then fold the corners you just made up and towards the middle so the other side of the loaf is rounded. Flip the dough over and place 2 pieces, seam-side down, on each baking sheet. Allow to rise, uncovered, for about 1 to 1/2 hours or until doubled. Preheat oven to 400°F. Bake the loaves for 10 minutes; then, brush with the remaining 1 tbsp olive oil and sprinkle with sea salt and remaining 1/2 tbsp rosemary. Continue baking another 10 minutes or until loaves are a golden brown. Remove from oven and allow to cool slightly on a cooling rack before slicing. Serve with olive oil seasoned with pepper, if desired. I don’t know why these rosemary peasant loaves got me thinking about simplicity. Maybe it’s because there are just a few, simple ingredients that render a delicious, strong mix of flavors. Maybe it’s because they’re called peasant loaves, and whenever I read that word I’m filled with thoughts of big, open, uncluttered pastures, prairie dresses and families working the earth together just to get dinner on the table. I know that’s pretty “Little House on the Prairie” of me — but I guess what I’m trying to say is, whenever I think of peasants, I think of a rich, full life. A simple life, but a full one. It’s the kind of life I try to live every day. Though it’s not easy, I still do think it is possible. 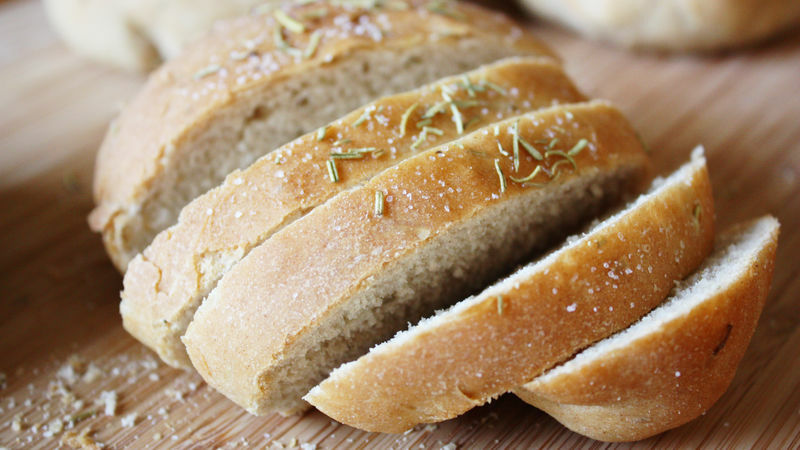 What I like about this bread is how simple the ingredients are and how easy it is to make a loaf that is so flavorful. The mix of aromatic rosemary herbs, savory olive oil and crunchy sea salt is one of my favorite flavor combinations. It’s hard to pinpoint which ingredient really makes the loaf shine – they all work together equally, and each bite is filled with a medley of all three flavors. Even with all those flavors working together, this bread isn’t pungent – but it still gets your attention. Served warm and fresh out of the oven with olive oil and freshly ground pepper on the side, these loaves are perfect sidecars to a filling – and simple – meal.